When a nephew in Vermont suggested that I should not miss visiting America's Stonehenge in nearby Salem, N.H., I agreed it was something I needed to see. Once called Mystery Hill, this 4,000-year-old site has stone walls and structures with apparent astronomical alignments serving several possible purposes, such as acting as a calendar, predicting solar and lunar events, and determining planting and harvesting times. No one has solved the mystery of who built this site, which could be the oldest man-made construction in the United States. Various archaeologists have found an amazing range of prehistoric and historic artifacts. That it had been used later for other purposes was shown by 18th- and 19th-century housewares and iron wrist manacles that had probably been removed from slaves who used this as a stop on the Underground Railroad in the 1830s and 1840s. Need an account? Create one noA movie at the visitor center did little to explain who made these structures. I followed a self-guided tour map, which included information for 32 stopping points. For example, at point No. 18: "The 'V' Hut: This small chamber is named for its shape. The large basin to the left in front of the chamber is the starting point for a network of drains which extend to the east." There are a variety of man-made chambers, stone steps and walls. What really caught my attention was a 4½-ton sacrificial rock, a table that left little doubt to what is was because of the grooves around the sides that led to a channel to allow blood to flow into a container. The archaeologists working on the project felt this was important enough to build a special viewing platform so visitors could look down on the slab, which had underneath a speaking tube that could carry sounds from the nearby oracle chamber. How was it possible to work stone without any metal tools, or even to lift them into place with only muscle? Some people think aliens from outer space constructed the site, but I'm sure aliens also would have polished their work. Visitors are given an astronomical trail map pointing out the complicated alignments of the stones and the information they convey. For example: "When viewed from a large boulder about 20 feet north of the south end of this wall, the Winter Solstice Stone (C) becomes the most southerly position of the 18.61 year cycle of the moon." Wow. How many years of observation would it take for one to come up with that alignment? Most of the stone alignments are more mundane, such as those that provide dates for the solstices and equinoxes. One theory is that Jonathan Pattee, the early owner of the land, had built the site, but carbon dating shows that it was built around 2000 B.C. The number of theories about other builders is rather overwhelming, with the following being candidates at one point: Atlantan, Maltese, Norse, Irish and Celtic colonies. Others think it was some American Indian group. I left the site thinking the builders were more advanced than any other American group of the time in their knowledge of stonework and astronomy. Franklin Pierce, our 14th president (1853-1857), often is listed in history books as one of the worst U.S. presidents. He is considered to have been a weak president. 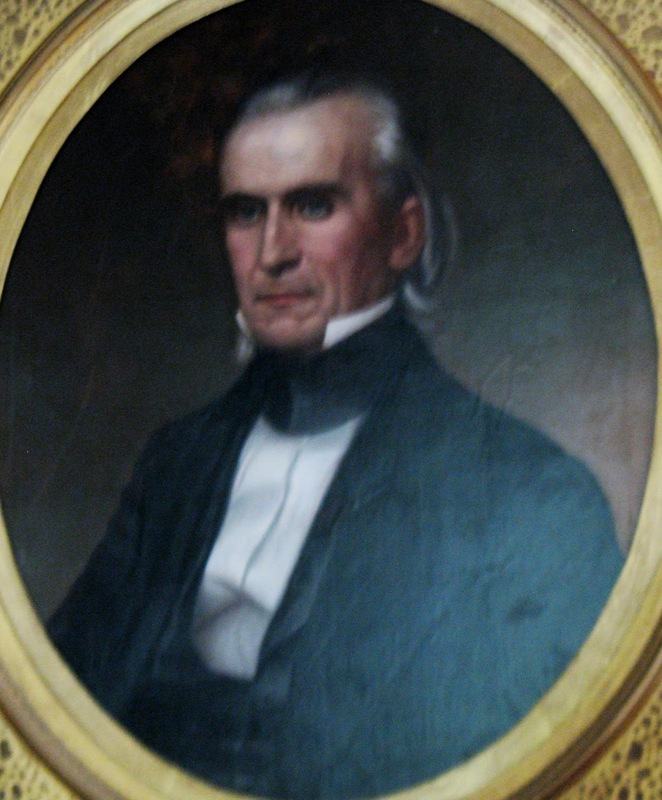 He was pro-slavery and is blamed for the Kansas-Nebraska problems over the right of states to choose slavery that resulted in the clash known as "Bloody Kansas." Some reports also claim he was an alcoholic. Need an account? Create one now. But at the Pierce Manse in Concord, N.H., the only museum dedicated to his presidency, a major attempt is made to correct these myths. After my visit, I certainly would move him up the list. Pierce had an ideal background for a president. He had served in both the House and the Senate and went from private to brigadier general in the Mexican War, where he performed heroically. Although he was a compromise candidate after 49 ballots at the nominating convention, he won the presidential election by a major margin against Whig candidate Winfield Scott, who had been commander of the U.S. forces during the Mexican War. Pierce experienced much tragedy in his life; two sons died early, and his beloved son Benny was killed at age 11 in a train accident as Pierce watched. His wife went into a depression but still managed to help him entertain when he was president. Only after she died of tuberculosis in 1863 did he develop problems with alcohol. What about the visit changed my mind as to where he should stand in the rankings? He made the Gadsden Treaty, which established the contiguous 48 states. His support of Commodore Perry established trade with Japan. He set up the Civil Service Department, which required holders to have the necessary skills for the job. He had surveys made for plans for four railroads across the United States. He reduced the national debt. And, he was interested in the welfare of American Indians. 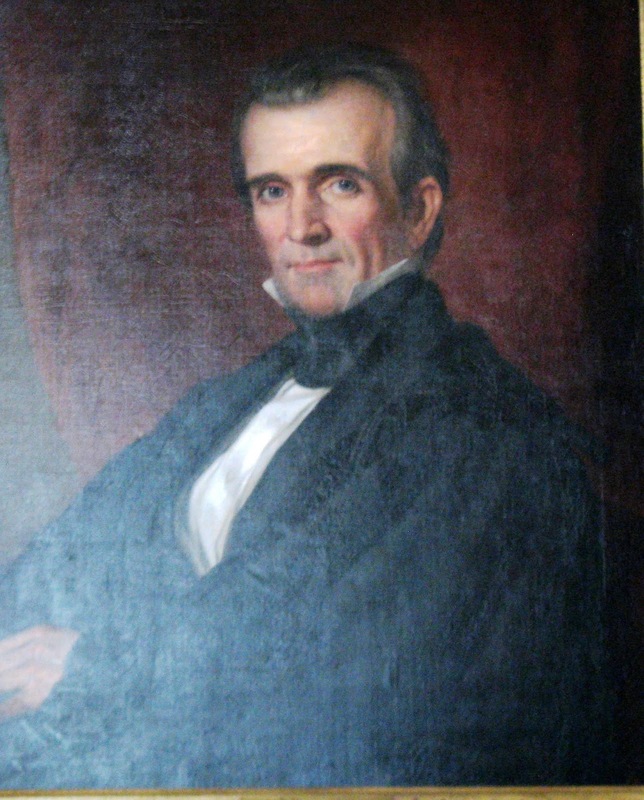 His strict interpretation of the Constitution got him in trouble with the anti-slavery groups because he believed the Constitution gave the states rights to set their own laws about such things as slavery. The alcoholism charge did not hold during the presidency as his wife would not let him drink, even at parties. The Pierce Manse, where he and his family lived before he became president, is a large, well-preserved home with period furniture. Concord has another attraction I also enjoyed: New Hampshire's state capitol. It is the oldest capitol building in which the legislature uses its original chambers. The Senate is one of the smallest, with only 24 members, and the House of Representative the largest with 400 members — one for every 3,000 residents of New Hampshire. Constructed in 1819, it was enlarged twice and still is the smallest capitol building in the country. The most noteworthy feature is the Hall of Flags in the entrance, which includes 103 flags of New Hampshire military units from all of our wars and memorabilia of Alan Shepard's moon walk. It is obvious from their condition that many of the flags had seen battle and perhaps other hardships. If you are getting this message, it’s because your browser is blocking cookies. For free access to this full story, please enable cookies in your web browser. The Museum of Native American History in Bentonville, Ark., is a gem in providing a comprehensive history of American Indians as shown by their artifacts. I have visited 45 such sites and museums, and found this museum to be surpassed only by the National Native American Museum in Washington, D.C., which is supported by the U.S. government, in terms of range and depth of materials covered. The Bentonville museum is the vision of one man, David Bogle, whom I interviewed during a visit to his museum. Bogle, a member of the Cherokee tribe, started his collection as a Boy Scout. Later in life, he started buying other collections when they came on the market. In 2008 he moved the artifacts into a building that had been redesigned to hold them. His wife was happy to get them out of the house to give her some room, Bogle said. When the University of Arkansas Museum closed because of lack of funding, Bogle was given access to its 2 million artifacts in storage, some of which are included in his museum. Arrow heads 12,000 years old are on displayThe Museum of Native American History in Bentonville, Ark., is a gem in providing a comprehensive history of American Indians as shown by their artifacts. I have visited 45 such sites and museums, and found this museum to be surpassed only by the National Native American Museum in Washington, D.C., which is supported by the U.S. government, in terms of range and depth of materials covered. The Bentonville museum is the vision of one man, David Bogle, whom I interviewed during a visit to his museumBogle, a member of the Cherokee tribe, started his collection as a Boy Scout. Later in life, he started buying other collections when they came on the market. In 2008 he moved the artifacts into a building that had been redesigned to hold them. His wife was happy to get them out of the house to give her some room, Bogle said. When the University of Arkansas Museum closed because of lack of funding, Bogle was given access to its 2 million artifacts in storage, some of which are included in his museum. Need an accBogle said his intention is to educate the public about the complex and long history of American Indians by offering the usual objects people know about from the movies but also introducing them to a more complete history. One way he has done this is with an excellent audio tour that gives a brief description of many items. If you want to know more about a particular piece, you push the pound key. For example, on spear points you get a description about how they were used and how shapes mattered; pushing the pound key you get a description of the two kinds of tools and methods that were used to create them. Modern Americans have come to expect a new invention or product every month. In this museum, we see how slowly new products came into use as conditions changed and geniuses of the Thomas Edison level came up with new tools and crops to ensure survival. We need to remember that there was no way to preserve information or to share it widely, so their tool kit developed over thousands of years without the advantages of books or metal. The museum introduces us to the different time periods, each section starting with either a brief informational film or audio recording. We began with the Paleo Period (12,000 to 8,500 B.C.) when Indians hunted mastodons and other giant animals using mainly the spear and the stone knife as weapons. The number of excellent tools of the period is impressive, as is the commentary on their different uses and development. People living during the Archaic Period (8000 to 1000 B.C.) had to develop new ways of living and hunting because of the extinction of the giant herds. The world was warming, and different tools were needed. Some ancient genius developed the atlatl, a spear launcher that added distance, force and accuracy to a man's throwing arm. Stone tools were being invented to process nuts, berries and roots, as were tools to work wood into useable shapes such as boats and ax handles. In the Woodland Period (1000 BC to 900 A.D.) villages became larger and cultivated crops became necessary for survival. During this time, the Indians invented the hoe by attaching large sharp stones to wooden handles. Burial customs became complex, and the mound culture became more widespread across the continent. Some rebel invented smoking, and fancy pipes cut out of stone became common. At this point in the museum we moved into a more modern period. In the first part of this story I’ve focused on the first 12,000 years of Native American history. In this part the emphasis will be on the two more modern historical periods. During an interview, museum owner David Bogle, who is a member of the Cherokee tribe, stressed that his goal is to educate the public about the history of American Indians through their artifacts. The complex pottery pieces in the displays for the Mississippian Period (900 A.D. to 1650) were excellent. The great cultures that existed during this time period began to disappear. Nineteen out of every 20 American Indians died, probably because of the introduction of diseases from the Europeans, such as small pox.Need an account? Create one now. The Historic Period (1650 to 1900) is the one most of us are familiar with. Of the many displays for this era, I especially enjoyed that of the work of Edward Curtis, a photographer who, with the backing of President Teddy Roosevelt and J.P. Morgan, spent 30 years involving himself in the American Indian cultures west of the Mississippi before they disappeared. The Crow Indians called him the "One Body Image Taker." He was not supported by the government Indian agents who were trying to wipe out Indian culture, rituals and language. Curtis used an old-fashioned glass-plate negative camera that produced a very sharp, dark-brownish picture and required the American Indians to pose, producing very striking, personality-filled pictures. No other historian recorded so much of the histories of the various Western tribes. He was impressed with the details of the "myths" that traced the movements of the tribes over many years, so he learned where they had originally lived. He is considered the best source of factual material about the lifestyles and rituals of the Indians west of the Mississippi. 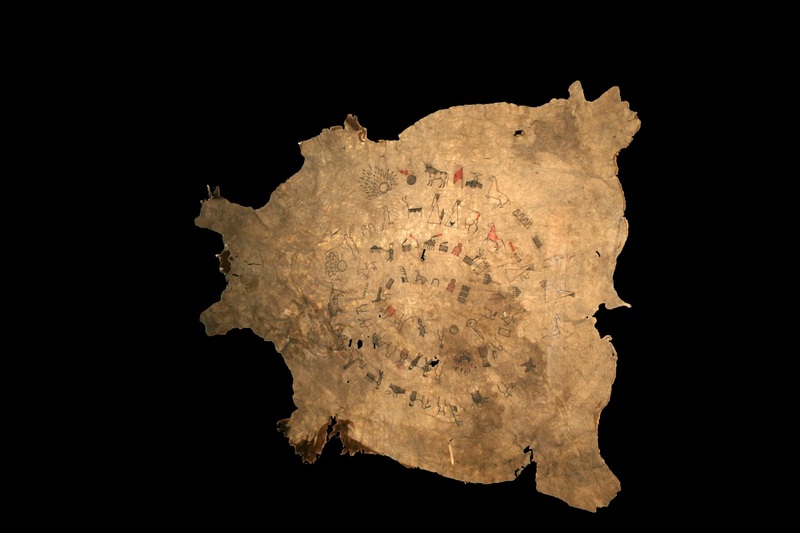 A bison hide with symbols that help the tribe historian remembers what happened each year. 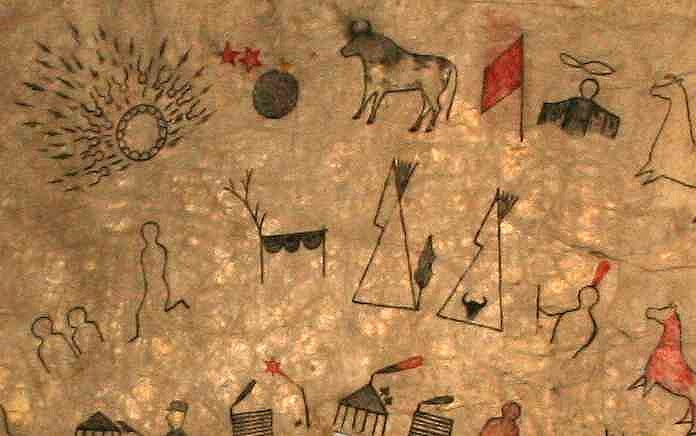 Although the histories of various tribes were largely oral, bison hides emblazoned with symbols portraying major events from past years served as memory devices for the tale-tellers. I also was fascinated by the large bison hide covered with symbols arranged in a circular pattern called a "winter count," a concept I had not been aware of before despite having visited many other American Indian museums. The histories of the various tribes typically were recounted orally, and the winter count skins were developed as a memory device. Each symbol represents a year, from the first snow of one year to the first snow of the next, and the group decided which event would become the symbol to help the tale-teller remember all the other important events of the year. 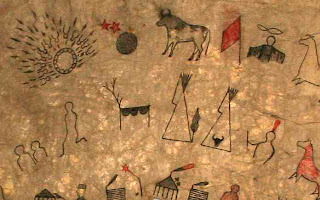 A book on the winter count helps visitors decipher the symbols, which refer to such things as a smallpox attack, falling stars, the coming of cattle and various battles. Each skin could cover 70 or 80 years of history. There is much more to explore. Bogle said he was very pleased when he saw the free audio tours drawing the intense concentration of schoolchildren who visited the museum. For anyone interested in American Indian history, this is a gem of a museum. When we went to visit the Jimmy Carter Museum and farm in Plains, Ga., we were surprised to learn there are no motels in this small town. We asked a museum attendant where we might stay, and he gave us directions to the Historic Inn and Antiques Mall, a complex he said had been renovated by Rosalynn and Jimmy Carter. When we arrived at the inn, Jan, the hostess, informed us that Wayne had mispronounced Rosalynn's name; it is pronounced as two words, Rosa Lynn, those being the names of two of her ancestors. Jan said she had frequently traveled with Rosalynn during the campaigns for the presidency. Despite the large number of visitors to Plains, it has remained too small a town at 700 people to warrant a regular motel or hotel. This concerned Jimmy Carter, who felt the area should have some place for visitors to stay. In 2000, the Carters undertook the creation of the Historic Inn. He decided that a large empty storage area above several shops could be turned into rooms for a bed and breakfast. Using his skills as a carpenter and his experience working with Habitat for Humanity, he designed the area. With help from prisoners, seven rooms and a living/dining area were constructed. Six of the rooms rent for the same price, and the presidential suite costs a little more. Rosalynn helped design the décor of the rooms, each around a particular decade starting with the 1920s. Jan said every room is a history lesson and encouraged us to examine each one before making our choice. The rooms are large, complete with a sitting area with couches, desks, telephones and bookcases of the period and period-appropriate books and magazines. The '30s bathroom has a claw-foot tub, and the '40s room has twin beds, which were in fashion during that era. The only thing that didn't fit was the modern television sets. The mod '60s bedroom, with its colorful red and white accents, met our mood for the evening. We were surprised to find that only one of the other rooms was taken right then, but Jan said their existence is not well-known, and tourists usually make arrangements to stay in the nearby town of Americus. Some visitors make special arrangements to stay at the inn so they can attend Sunday school classes at the Plains Baptist Church, taught by Jimmy Carter when he is in town. We were told we would need security clearance to attend. There are also some specific rules of conduct; never applaud and only take pictures at the opening, when Carter gets in front of the mike. We had dinner at the family restaurant where Carter often has coffee in the morning. He maintains a highly personal relationship with the people here and continues to be interested and involved in local activities. I found it interesting he could keep these intimate relationships given the security team that stays here to protect him. Our impression is that when he is not traveling, he is probably living the most "normal citizen" lifestyle of any of our former presidents. How does a great mural get made? The new exhibition, “Benton and Truman, Legends of the Missouri Border,” at the Truman Library and Museum in Independence, documents how two great Missourians, former president Harry S. Truman and artist Thomas Hart Benton, collaborated to create the mural, Independence and the Opening of the West, that adorns the museum’s entrance. The exhibition, which runs until October 14, focuses on their parallel careers, the process involved in creating that mural, and on a collection of Benton’s paintings and sketches, some of which were loaned by the State Historical Society based in Columbia. We were given a preopening tour by Clay Bauske, the museum curator who had organized the exhibition. Workmen were still making minor changes, but the main materials were in place. Raymond Geselbracht, a special assistant to the director of the library, gave us additional background information particularly on the remarks of Truman and Benton. Both Truman and Benton were born in western Missouri in the 1880s and died there in the early 1970s, both were committed Democrats who spoke their minds bluntly and freely, were voracious readers particularly of history, and were great tellers of tall tales. Both spent 1906 to 1921 searching for identities and both gathered strength for their future by serving in WWI. They built their initial reputations from 1922 to 1940 and gained additional attention during World War II. Several of Benton’s paintings from that time are on display. When they first met in 1949, Truman bantered, “Are you still painting those controversial pictures” and Benton retorted, “When I get a chance.” Later in the 50s Truman had some reservations about the possibility of a Benton mural in the presidential library. He had not liked the mural that Benton had painted at the capitol in Jefferson City. An unsent letter in the exhibition says, “I won’t encourage him to do any more horrors like those in Missouri’s beautiful capitol.” Truman was noted for writing scathing letters when annoyed, which his secretary sometimes delayed in sending allowing him time to reconsider when he had cooled off. He particularly resented the image in that mural of his mentor Tom Pendergast, a controversial political boss, until he learned that Pendergast had posed for it. 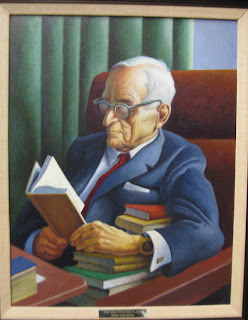 But once past such initial misunderstandings and fueled by a bit of bourbon Truman and Benton had great discussions about art, literature and politics, and Truman approved the library’s choice of Benton as muralist for the project. Truman and Benton working on the plans for the mural, Legends of the Missouri Border. Then the question became what would the mural in the library include. They early on decided that it would not be about Truman’s life and contributions to history, but instead would focus on Independence as the starting place of the greatest migration in history as trappers, explorers, and pioneers used it as the stepping off place to the West. A major part of the exhibition shows the step-by-step process to create the mural. In a 14-minute film Benton describes the historical background that led to the way he arranged the characters in the painting. Benton created and played on his harmonica the background music in the film with his daughter Jessie playing the guitar and singing. As we toured the Carter Boyhood Farm in Plains, Ga., we could see how his early experiences there contributed to the development of the attitudes and strengths that led Jimmy Carter to become our president in 1977. The National Park Service bought the farm in 1994 and restored it to its condition in 1930. At each stop we almost felt like we were having a personal tour led by Carter himself. Recordings of him chatting about his life as a child were available at the house, barn, outbuildings, and equipment. On the first tape he talks about how important it was that everyone play a role in doing their fair share of the work, even the animals. He sounded like he had a little guilt about the pony he got for a birthday because it didn’t do any work and just was available for him to ride in the little free time he had. And there was work--it sounded like most people on the farm worked from four in the morning until eight at night. When Carter wasn’t working, he was reading. His energetic mother, Miss Lillian, saw to it that he read the right things, and he early fell in love with books. He indicated this was part of the reason he wrote so many of his own. The bookstore at the museum had 20 books written by him--I couldn’t resist buying the one about his early farm life. We could see attempts had been made in modernizing; for example, the farm equipment progressed from a hand pump for water for the animals to a windmill and finally to an electric pump. Carter viewed Plains as a big city and didn’t feel a part of that community as a boy. Instead his friends were both the black and white boys in the area who didn’t make racial distinctions. When he was 14, he was shocked to see the black boys now deferring to him, which changed the whole relationship. The black Jack Clark, who was in charge of the 25 mules and horses, was an alternate father to him. Clark and his wife Rachel taught Jimmy many things, and he stayed with them when his parents were gone. The Clark house has been reconstructed along with the barns and outbuildings. Carter’s father had a store on the land because many of the locals didn’t have much cash to buy things and needed some place to charge on credit. It was officially open only on Saturdays, but Jimmy relates that he seldom could eat dinner without someone coming over to get something from the store that they absolutely needed. Sometimes that something only cost a nickel. The store is stocked as it would have been in the 1930s. Carter tells the story of the neighbors gathering to hear the Joe Louis/Max Smelling fight on the battery radio in the Carter’s living room. I don’t remember ever being at a museum where the person of note gave such a personal introduction to his life. For example, he told how the most memorial experience of his life was not winning the presidency but the first time he was allowed to plow with a mule. It was a coming of age experience for him. He also talked about the early influence of his Uncle Tom Gordy who served in the navy. Carter later graduated from the Naval Academy in Annapolis. The family garden has some notes about what they grew, some vegetables I had had little experience with like black eyed peas, yams, velvet beans, collard greens and sugar cane. The machine run by mule power that squeezed the juice from the sugar cane and the cooker for making syrup was still on the grounds. As a boy Carter led a hard demanding life, but he was surrounded by caring people--that seemed a fitting background for a future president. When Franklin Roosevelt contracted polio in 1921, it seemed that his hopes of becoming president had been smashed, but in 1924 he discovered Warm Springs, Ga., and those hopes revived. Although the waters did not cure him or make it possible for him to walk without braces, they did improve his spirit and gave him the opportunity to discover new forms of treatment and to help other polio victims. He returned to Warm Springs frequently staying in the small house he designed, which became known as the Little White House. Here as president he developed a number of the New Deal Programs, such as the Rural Electrification Administration, based upon his experiences and contacts with local people in this small out-of-the-way Georgia town. Roosevelt died here in his favorite home in 1945. While his portrait was being painted by Elizabeth Shoumatoff, he quietly fell forward. He was moved to his small bedroom where he died and was embalmed. Our guide explained that his smoking had probably contributed to his death. He had for years smoked three packs a day of unfiltered cigarettes but had been slowly cutting back. The furniture throughout the house has burn marks from his cigarettes. The furniture and equipment have been left as they were the day he died. Constructed with local materials, the furniture was built by a company owned and developed by his wife Eleanor. Our guide pointed to a special feature of the bathtub that allowed Franklin Roosevelt to rescue the soap when it slipped away from the soap dish. In the dining room/office he had a recording machine as part of his radio/record player. His secretary Missy Leland, whose tiny bedroom is included in the tour, would type the material promptly. Eleanor seldom visited him here, but her small room was frequently used by their children and other guests. Present when he died were his daughter Anna and Lucy Mercer Rutherford, a factor that added to Eleanor’s grief as she had been told he was no longer in contact with his former mistress. Although he and Eleanor had reached the point of separate bedrooms earlier, they had continued to be very supportive of each other, and she was in many ways his eyes on what was happening in the country. Originally the basement of the house had been used as a museum. Now a new modern building has been constructed with a large theater that shows a 20-minute film of his life with emphasis on his connection to Warm Springs. The museum is similar to the standard presidential museums giving the story of his life with many pictures, video clips and excerpts from his fireside chats and other speeches. Brief bios are given of the people closest to him\-- many such as his cook, secretary, and advisor, Louis Howe, he had with him for years. His patio furniture, part of his stamp collection and an impressive collection of canes sent to him by admirers are also on display. Franklin Roosevelt’s 1938 Ford especially equipped to be driven with hand controls. Roosevelt developed or invented some equipment, such as hand controls for cars, making it possible for him to drive. One of the cars, a ‘38 Ford is in the museum and a ‘40s Willys roadster is in the garage at the house. He enjoyed driving around the area talking to the locals. The guide said he spent time showing the farmers how to rotate crops and use new methods to improve their lives. We missed seeing, Robert Prater, a Roosevelt re-enactor who is sometimes available at the house and who appears around the area in role. The unfinished portrait of Roosevelt that was being painted as he dropped forward dead. 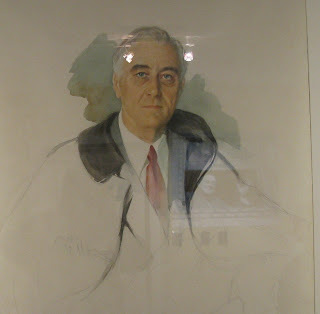 On our recent visit to Warm Springs, Ga., we were surprised to learn how much President Franklin D. Roosevelt had influenced present physical rehabilitation treatment programs for people with handicaps. When as a polio victim he started treatment here in 1924, he was impressed with the amount of improvement he felt when he spent time in the warm waters. The Indians in the area, who had used the waters to treat various ailments and wounds, felt a special healing spirit was here. Roosevelt agreed and decided to buy land and start a treatment center. To help finance a center he originally wanted to provide a resort for well people also, but quickly discovered that many well people avoided physical contact with polio victims from fear of catching the illness themselves. We toured the campus of the Roosevelt Warm Springs Institute of Rehabilitation with a delightful lady guide, Linda Creekbaum, who had been closely involved in the program for years and had met many of the people who had been here as children who returned to visit as adults because the treatment program had been so important in their recovery. They had often cried when their parents left them, but then cried when they were taken home because this place had been so important not only for their physical rehab but also their mental rehab. Little rehabilitation had existed before the institute had been established. Roosevelt felt that attention was needed not only to physical treatment but also to the individual’s mental attitude. As the children had often been treated as cripples whose lives were over, Roosevelt tried to present an image of someone who was successful in spite of his paralysis. The seriousness of his handicap had not been made known to the rest of the world and only three pictures taken by family are available of him in a wheelchair. Roosevelt’s paralyzed legs would not allow him to stand without braces, but in the waters he found he could. A movie shows him playing happily in the water with children who had polio--a movie that was never shown to the general public during his lifetime. In describing the facility the term campus is used rather than hospital and the campus is structured on Roosevelt’s orders to look like the University of Virginia with covered walkways and connecting hallways. A special area gives the hall of fame of polio with the work of A. B. Sabin and J. E. Salk being highlighted. With their work on vaccines the need for polio treatment diminished, leading the institute to develop into a treatment institute for stroke victims and others who need physical and mental rehabilitation. The Polio Hall of Fame honors those people who contributed to the eradication of polio in most of the world. The concept of treatment was so new many treatment techniques and much of the equipment used here needed to be developed from scratch. Because mental attitude was important, Roosevelt felt self sufficiency needed to be developed, resulting in the children being given considerable freedom to try different activities. One of the patients from Missouri was Congressman Ike Skelton whom our guide knew well. In her stories about him she stressed how he had worked to make a handicap friendly environment with low curbs, wide doors and elevators eventually becoming a national priority. We examined one of the small pools. The 88-degrees water comes out of the ground at over 900 gallons a minute. Visitors for a small payment can experience what it is like to use one of the pools. The campus is now a National Historic Landmark. The dining hall by Roosevelt’s order was upscale for the patients with waiters in coat and tie and special attention to the quality of the food. Roosevelt drove his own car around the area and used it as an opportunity to talk to the locals, which introduced him to a whole new way of life he had little way of knowing about from his rich, protected background. Roosevelt’s work had a wide influence. For example, his ideas were used when the University of Missouri became the eight-state center in the Midwest to become environmentally friendly for handicapped students in 1960s.